… is the one between your ears. … the one that powers all your decisions. … the one that thrusts you into action that helps you achieve your goals. 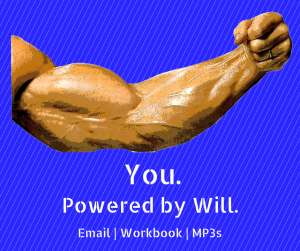 In other words, you should be working on that marvelous human muscle known as the Power of Will. It’s been known for over a hundred years that the Power of Will can be exercised, tested and strengthened like a muscle. Your Power of Will is no different. And just as you have biceps, and abs and calves and thighs that respond to exercise, you also have a Will that responds in kind. You know this. You have experienced periods in your life when you felt strong, and took action. And when you took action, you felt stronger, and more confident, and took more action. In other words, you exercised and strengthened your Will. Of course, there were other times when you didn’t, or thought that it was beyond you. In those times you were also using your Will – perhaps not as effectively as you could, but still. And just like your other muscle groups, when it comes to exercising your Will, you just have to do it. You can get started in the same way – with a simple decision. And just like you get on the treadmill when you don’t exactly feel like it – and feel great afterwards, the same goes with the Will. And then day after day, you keep at it. Some days are dynamic, some you just go through the paces. You know, that if you just keep at it, your muscles respond. You know that if you keep working on developing your Power of Will, you will reap the rewards. We have a simple program that can get you started. It runs for 21 days, and only takes just a couple minutes a day. You can choose to listen to the 21 MP3s, or download and print out the workbook, or just read the daily emails. They are all based on the same idea – that if you think about, and begin to use the wonderful muscle known as the human Will, you will get stronger. You will feel more alive, more in control of what happens to you. More capable of making your dreams come true. In fact, we will go so far as to say that none of your dreams will ever come true if you don’t strengthen this fundamental human muscle. Think about You. Powered by Will. Think about what you can accomplish in the next 21 days if you knew you could not fail. That’s what your Power of Will can do for you. And the victory will be all yours. 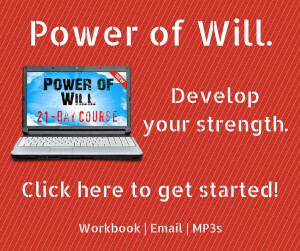 Click here to register for the Power of Will 21-Day course and we’ll make sure you get this simple tool to begin your journey in Will development.